Dinner Lady Tuck Shop E-liquid – Buy 2 Get 1 FREE! 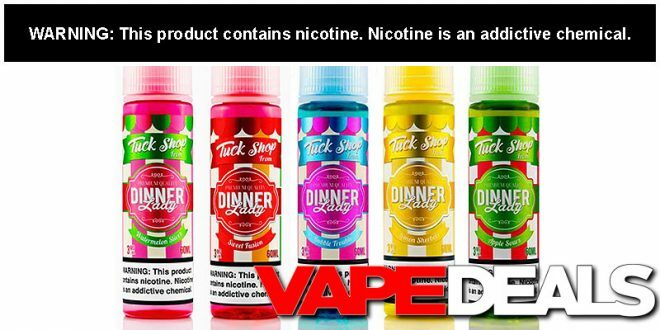 If you’re interested in trying the new Dinner Lady Tuck Shop line, you might want to head over to Eightvape. They’re running a special deal right now: purchase any 2 bottles and you’ll get a bottle of the Apple Sours flavor for FREE! No coupon code is needed, a pop-up window should appear when you view your cart (if your order qualifies). The regular price is $11.99 per 60mL, so you’ll be looking at a total of $23.98 after the discount. You gotta act fast though—this offer expires TODAY (2/14) at 11:59pm PST. **Eightvape Members Price: $22.30 + FREE shipping.